In his previous article, Fr. William Serra LC reflected on the need and benefits of opening up our wounds to Christ in prayer. (http://live.regnumchristi.org/2013/11/letting-christ-heal-my-wounds-in-prayer/.) This article reflects on ten attitudes that help us open our wounds in prayer to the Divine Physician, who reaches out to heal us, showing us how to experience Mercy in the midst of our misery. 1. Openness of Heart: come to prayer with an open heart, a spirit free of self-concern, and a willingness to lay bare one´s wounds. Openness unburdens the soul and raises it into God´s loving presence, entering into the very heart of Mercy. 2. Gratitude: begin by thanking the Divine Physician. Thank Him for everything, both for what He gives and what He takes. When He takes, it is only to give even more. Everything is His loving gift. Thank Him for His guidance and care. 3. Contrition: experience the sorrow that comes, not from seeing oneself as imperfect, but for having offended Christ, your friend. Contrition flows from love and out of love. 4. Joy: trusting in Christ’s healing power, we share in His joy, because He desires to heal us. We should gladly and confidently receive His healing. 5. Love: it is love, not fear, which drives us to the Divine Physician to pray, “Lord, I have offended you. I have loved little.” Let His Word pierce your soul, and let your heart walk in the Love that knows no end. 6. Wonder: admire His healing touch that makes us clean. Live the mystery of His wounds, which have healed you. 7. Amnesia: God suffers from forgetfulness. He does not remember our sins. His forgiveness is total and complete. Who are you to worry about something He no longer remembers? Forget your sins and remember only His mercy. 8. Praise: Be in awe of Him, who is so close and so mighty, yet He respects your freedom. He waits and does not push. 9. Friendship: Renew your friendship with Him, a friendship sealed through each confession, by your openness and His mercy. His blood mingles with yours to cleanse you and purify you. 10. Accept the Father’s Embrace: experience the embrace of the Father of Mercies. His unconditional love forgives all. This Father hugs you so tightly you can barely breathe. Resolve to love Him more and better, and not to offend this loving Father again. Fr. Guillermo Serra, LC, was born in Madrid, Spain, and now lives in Mexico City. 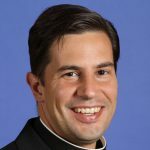 Since his ordination in 2004, he has been leading people to know and embrace Christ’s love, learn to go deeper in prayer, and recognize God’s presence in their lives. A well-known writer and speaker, Fr. Guillermo has published two books on prayer, Sal de tu Cielo and Jesús a mi Alma. He is also one of the most followed priests worldwide in his vibrant social media ministry, through which he seeks to introduce people all over the world to Jesus Christ. He has worked in Italy and the United States, and is currently serving as Director of Formation at a school in Mexico City.